The Senate yesterday suspended the consideration of President Muhammadu Buhari’s nomination of 27 persons for appointment as Resident Electoral Commissioners (RECs). The upper legislative chamber hinged its decision on the president’s failure to respect its resolution not to confirm the nomination of the Acting Chairman of the Economic and Financial Crimes Commission (EFCC), Ibrahim Magu, as the substantive helmsman of the agency. With this development, the chilling cold war between the executive and the legislature is threatening to assume a hot dimension. That is, the two elephants which have been sizing up each other are now locked in fight and the grass- good governance – shall bear the brunt. The executive and legislature are two crucial arms of government that should maintain a harmonious relationship to achieve good governance. A conflict between both will undermine an effective implementation of government policies and programmes. Also yesterday, the Senate said it had resolved to defend its integrity and itself against any attack. Rising from a marathon closed- session that lasted for two hours, the lawmakers declared that they would not be intimidated in the course of carrying out their responsibilities. On the suspension of consideration of Buhari’s nomination, the Senate said it was wrong of the president to continue to keep Magu in acting capacity despite its decision that he should be replaced outright. Adopting a motion sponsored by Peter Nwaoboshi (PDP, Delta North), the Senate directed its President, Bukola Saraki, to within two weeks convey its position about the non-replacement of Magu to Buhari and report back to allow it take further legislative action on the matter. Deputy Senate Leader, Bala Ibn Na’Allah, had in a separate motion urged the lawmakers to consider the nomination of the REC-designates in accordance with section 14 (3)(a) of the Third Schedule of the constitution as amended. But in a feat of anger, the senators rose in total disagreement with Na’Allah’s suggestion, asking that the nominations be rejected. Nwaoboshi, in his argument, drew attention of his colleagues to what he called the disgraceful manner in which the Senate’s decision against Magu is being treated by the president. He specifically expressed disappointment with remarks allegedly made by the chairman of the Presidential Advisory Committee on Anti-Corruption, Prof. Itse Sagay, to the effect that the president could ignore the decision of the lawmakers on Magu and continue to keep him in acting capacity. He suggested that the REC nominees be sent back to the president. 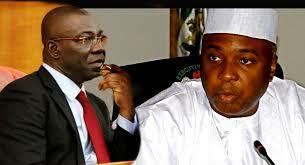 It took the intervention of Saraki and his deputy, Ike Ekweremadu, to persuade the lawmakers to agree to suspend the consideration of the nomination for two weeks as most of them had already made up their minds to throw out the president’s request. On its decision to resist intimidation, the Senate vowed that it would protect its integrity by doing whatever it takes to ensure that it is not taken for granted while discharging its constitutional responsibilities. The Senate said it took the decision, following a series of coordinated attacks against it by external forces. Saraki, who made the disclosure, did not give details or reveal the identity of the external forces. The lawmakers’ position may not be unconnected with the recent face-off with key members of the executive, particularly the Comptroller-General of Nigeria Customs Service (NCS), Col. Hameed Ali (rtd) and the Secretary to the Government of the Federation (SGF), Mr. David Babachir Lawal. Senate spokesman, Aliyu Sabi Abdullahi yesterday clarified the controversy surrounding the importation of a vehicle, saying the chamber didn’t buy any SUV at N298 million. At a press briefing in Abuja yesterday, Abdullahi said the correct price of the vehicle when it was imported in 2015 was $298,000 which at the prevailing rate of N165 to a dollar was about N49m. The investigation into the alleged purchase of the SUV was stalled yesterday following the failure of the Nigeria Customs Service (NCS) to appear before the Committee on Ethics probing the matter. Atiku sells mansion for $2.5 Million in United state.